Jugaad is Hindi for “an improvised solution bom from ingenuity and cleverness” (De Vita, 2012: 21). 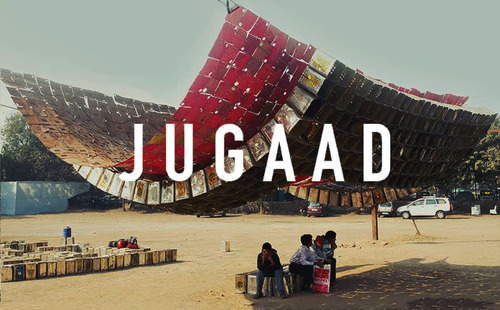 Sometimes referred to as “frugal innovation,” jugaad is a way to think about most of the world’s experience with and approach to infrastructure, according to Vyjajanthia Rao (2015) in an essay featured in the edited book Infrastructural Lives. Defined as “innovative, improvisational urban practices and the objects they produce as temporary “fixes” or solutions to systematic problems,” Rao (2015: 54) notes that while the dominant “decay discourse” overwhelmingly depicts infrastructure as dilapidated and falling apart, this dominant discourse provides an almost too perfect foil for the conviviality and colorfulness with which jugaad is often celebrated with. One critical argument of the “new” new institutionalism is that actors are always jockeying for position in existing fields. They are always trying to better their situation and in doing so, can create change in both their position and the underlying order of the field. This produces two distinct kinds of change, the change whereby a new institutional order comes into existence and the more common situation whereby change is more gradual and continuous. But this view of the world posits two radically different states, one where we can be agents and make our world and the other where we can do little about it. “A Theory of Fields” undermines this entire line of argument by asserting that actors are always acting and this means they are always struggling. They are in a battle for position and the game is always being played. This means that “A Theory of Fields” is part of a “new” new institutionalism that honors actors, sees purposes, interests, and identities, and allows for stuff to happen all the time. Although I would reflexively add that what Fligstein seems to do here is itself the activity of an instiutional entrepreneur – trying to change the rules of the field or – if that turns out to be impossible – prepare the setup of a new field, I guess there are some common problematiques that both the proposed new new institutionalism and the infrastructuralist agend have in common: a focus on practice (The Theory of Fields draws heavily on Bourdieu), a focus on constant change, a curiosity for the question of how in a world of constant change patterned activity is produced and the focus on struggles (although we might be critical about the psychological undertone of the term struggle and rather speak of trials of strength). Seems the comment tool on Posterous is not working today, so here is my comment to Jan-H. about Barley, the neo-I crowd, and technology. While I have always liked Barley’s work on technology, there is something I have got to get off my chest: in his super famous 1986 paper, the one about radiologists and new workplace technology (ASQ? ), what was he really showing in that paper that made him so famous? He showed that technology does not have a straightforward consequence when it enters a work place and instead can have different consequences in different workplaces. Well, I’d say “of course”. After all, the paper provides a counter point to a non-issue. Even in the literature at the time, it was almost unfair to ask: what is the single consequence of this technology for all work? Thus, his argument was pinned against is flimsy one, even for org studies. Here is why: they have been searching for that answer since the 1960s with Woodward who assumed one could “unlock” the consequences of industrial manufacturing technology, namely, the assembly line, for work in general, laborers, managers, etc. Guess what? She couldn’t. There was no single consequence. Tech did not uniformly speed things up. Tech did not shape each organization the same. Tech did not … and so on. Woodward assumed it would, or hypothesized as much, but Woodward was, in fact, learning what Barley would later test as a hypothesis the other direction. Barley assumed it the other way — that there would not be just one consequence of technology — and, unsurprisingly, found it. Well, in a way, of course he did; he found what scholars had been finding (but not looking for) for decades. 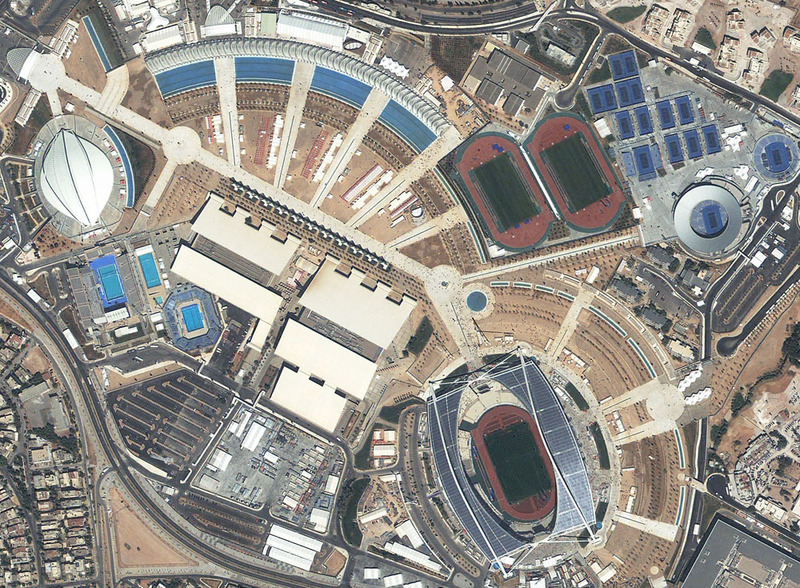 Derelict Olympic Stadiums Correlate with Trade Increases? … as material leftovers, structures for mega-events stand as forensic evidence that states are communicating to each other on an international platform through a material language. Recently, Jan-H. posted about the “pro-durability” bias in STS (or the possibility of it) and used the all too familiar case of derelict Olympic stadiums that pepper large urban settings; the leftovers of mega-events that struggle to find suitable use. The one stadium that refuses to give up the Olympic ghost and enjoys the lion’s share of the tourists is not a state-of the-art 21st century arena, but the Panathenaic Stadium of the ancient world. The structure was originally used to host the athletic portion of the Panathenaic Games in honour of the Goddess Athena. It was rebuilt in 329 BC – the only major stadium in the world to be built of white marble. Once seating 50,000 people, the Panathenaic Stadium also hosted the Olympics in 1870, 1875 and 1896. Its modern brethren pale into insignificance alongside such an impressive track record. But surely vast investment like that cannot be recouped … can they? Well, maybe, leftover infrastructure may be the by-product and correlate of trade increases. hosting – or even bidding on — “mega-events” like the Olympics leads to a 30% increase in trade for those countries (check it out here in the Wall Street Journal). 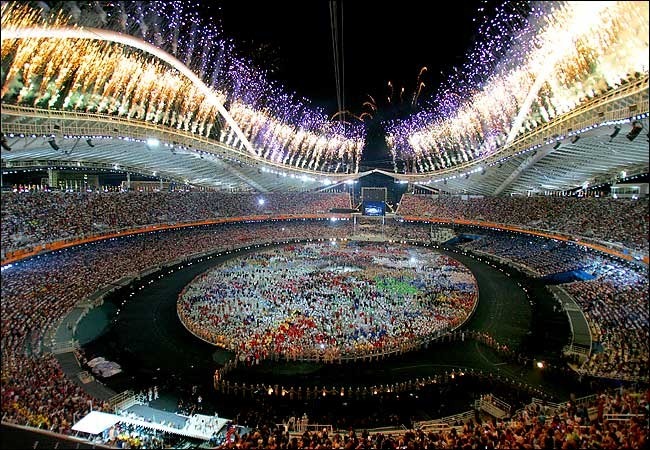 Economists are skeptical about the economic benefits of hosting “mega-events” such as the Olympic Games or the World Cup, since such activities have considerable cost and seem to yield few tangible benefits. These doubts are rarely shared by policy-makers and the population, who are typically quite enthusiastic about such spectacles. In this paper, we reconcile these positions by examining the economic impact of hosting mega-events like the Olympics; we focus on trade. Using a variety of trade models, we show that hosting a mega-event like the Olympics has a positive impact on national exports. This effect is statistically robust, permanent, and large; trade is around 30% higher for countries that have hosted the Olympics. Interestingly however, we also find that unsuccessful bids to host the Olympics have a similar positive impact on exports. We conclude that the Olympic effect on trade is attributable to the signal a country sends when bidding to host the games, rather than the act of actually holding a mega-event. We develop a political economy model that formalizes this idea, and derives the conditions under which a signal like this is used by countries wishing to liberalize. Such structures suggest that the hosting nation “is open to trade liberalization“; however, as Tom mentions (and as world events have shown), the Greeks are not enjoying this trade benefit. As Greece grapples with more than $370 billion of public debt, the dormant arenas have fueled anger over a lack of forward planning as the country ramped up to the 2004 Summer Olympics. For many, the disused venues – with their operating costs adding more pressure to the already-strained city coffers – stand as visible reminders of Greece’s age of excess spending. Infrastructural relics and ruins, or: is durability a good thing? When I walked the streets of Athens last summer and especially the modern ruins of the 2004 Olympic Games stadium complex I started thinking about an interesting issue of that durability bias that emerges once you turn the problem upside down. All these massive and nearly unused buildings, the immense work of finding (valuable?) ways of reusing this wasteland of steel and concrete – it appeared to me that it is not a case of creative appropriation, but that the sheer stability of this infrastructural setting localized in a greek suburb is creating the need for keeping it maintained and used (and if only in trivial ways). The backside of infrastructural stability seems to be that relics and ruins of abandoned infrastructure are just not going away, their stability is a problem, not a sollution. What if that is far more common issue? We all know about some similar effects: technological pathways for example or technological and institutional lock-ins. But the issues we decribe with that concepts have one thing in common: The are still with us (like the QWERTY keyboard) and we want to explain why other arrangements are not accepted. But if we start searching for lefovers, ruins and abandonded technologies and infrastructures…what could we learn from them? Are we living in a world littered with of institutional waste? An interesting, new-ish scholar to look into is Ben Cashore, Professor, Environmental Governance & Political Science; Director of the Governance, Environment, and Markets Initiative at Yale (GEM) and Director, Program on Forest Policy and Governance. Currently, I’m reading his co-authored paper on establishing legitimate non-state governance infrastructure, in his case, regarding the voluntary self-regulation for the development of forestlands and the sale of such harvests on the global market. 1. While there is much ado about “governance without government” most governance seems to be about government in some way or another; put another way, most non-governmental goverance is in fact quite governmental in terms of its origins, functions, and composition. For example, the International Monetary Fund (IMF) was established by legitimate states and its body is mainly composed of individuals in or with strong ties to existing governments and it was established by states as a way for states to deal with international issues. This is good hidden-in-plain-sight observation: there is such a thing as goverance without government, but the “government” never gets too far from sight. 2. Because non-state mechanisms, such as voluntary self-regulation for the development of forestlands, have little or no power to enforce standards/norms and authority to penalize non-compliant firms, the legitimacy of these operations becomes paramount to understanding them. Their authority or power, which tend to be limited, are contingent on their legitimacy (note: this is a bit strong-handed, so please read the paper for a more nuanced interpretation). Now, for the readers of this blog, this raises the issue of legitimate infrastructure. It is relatively rare to see work on infrastructure raise the notion of legitimacy, which is a concept that has many meanings and numerous analytical trajectories in various disciplines. In sociology, the new institutionalism is where I was first exposed to legitimacy arguments. Thinking back to Cashore’s work now, the development of non-state mechanisms such as voluntary self-regulation is influenced by the perceived legitimacy of the mechanism (and its relation to other mechanisms, conceivably), thus, might non-state infrastructural development follow the same underlying dynamic? All, as promised, I would reveal some early review document about Govind Gopakumar‘s new book on water infrastructure in India named Transforming Urban Water Supply in India. Do global efforts erase existing political underpinnings and re-inscribe a fundamentally new political basis, or does the existing social and political environment continue to influence infrastructures in the face of global pressures? (Gopakumar 2012:5). The question fits quite nicely with what Jan and I were thinking about as the new infrastructuralism. Govind’s research hints in many places, perhaps intentionally or perhaps he’s just feeling his way toward this or another new idea, of a broader theoretical contribution than is presented in the book. In this way, Govind’s book is somewhat bigger than it appears, both theoretically, but also literally, as the book is only 124 pages long. Concern over the relationship between processes of black-boxing and gradual taken-for-grantedness has been expressed a bunch of times on this blog — here, here, and here. Science and technology produce black-boxes, or fact and artifacts that are taken for granted; in particular, their histories are usually seen as irrelevant after good facts and successful artifacts are established (2010:120). It is nice that the world of ideas in science is not auotomatically labeled “taken for granted” (when facts are momentarily settled) and the world of things in engineering is not automatically labeled “black boxed” (when artifacts are momentarily settled) so that the distinction is not reified (i.e., that facts are only taken for granted and that machines are only black boxed). However, the two terms seem to be synonyms to Sismondo — do you agree with Sergio? In a recent post following Nicholas’s thoughts about blackboxing and taken-for-grantedness and about what that could mean for discussing the benefits of STS and neo-institutional theory, I asked: what are the difference between institutions and infrastructure? Nicholas and I discussed that today for the first time in detail and we thought it might be worth to post it to see if it makes sense. Neo-Institutional theory is – to tell a very long story short – based on the question of how many different things (organizations, models, cultural forms) become similar over time. This is the basic problem in DiMaggio/Powell (1983): understanding the institutional isomorphisms if the impetus of rationalization is taken away. It is the problem that Strang and Meyer works on when studying the institutional conditions of diffusion (1993). It´s central focus was – like Powell argued in 2007 – on “the field level, based on the insight that organizations operate amidst both competitive and cooperative exchanges with other organizations.” (2007). DiMaggio (1988) and Powell (1991) both noted that this was a bit too smooth and that institutional arguments would need a more detailed perspective on contestation, fragility and struggles. Nevertheless the framework provided a fresh and new way to understand institutions – so productive that it framed a discipline or two. Infrastructure studies, on the contrary, focussed on how things can appear systematic and highly-integrated but are actually implemented in many heterogenous, historically contingent local processes (Bowker/Star 1996/1996; Star/Ruhleder 2996). In some ways, diffusion becomes less important as implementation takes a more central role. Infrastructures are not build by system makers, but screwed together loosely by complex arrangements of interfaces, gateways and work-arounds, as Edwards has shown in 2003 and in his fabulous book on climate models (2010). However there seems to be a tendency to focus on normalizing and standardizing effects of classification systems implemented in large infrastructural settings – this is something like the Weberian “iron cage” of infrastructure studies visible already in “Sorting Things Out” and very strong in the works of Hanseth and Monteiro (1997, Monteiro 1998). The link seems obvious, doesn´t it? Neo-Institutionalism starts looking at heterogenous stuff and finds it similar – too similar perhaps, so that it is missing the complexity of the social world sometimes. But it is a great framework for strong explanations. Infrastructure studies look at systems and find them fragile and fragmented inside. But they seem to lack the “big explanatory” power, which leads to giving up the focus on local multiplicity and emphasizing standardization/normalization instead. Could the strengths of both be added to get a good grasp at the installation of social order under (high) modern conditions?